This discovery based laboratory introduces students to combinatorial chemistry by having students create new variations of penicillin and test the effectiveness of their compounds with a biological assay. Students synthesize new variations of penicillin by reacting 6-APA (6-aminopenicillanic acid) with an acyl chloride. Students isolate potassium salts of the penicillin crystals, and dissolve the crystals to prepare different concentrations of their penicillin. The different concentrations are added to test tubes containing bacteria and broth and students test the effectiveness of their new penicillin by seeing whether larger concentrations of the penicillin stave off bacterial growth in the solution. After all results are collected, the students share their results and the class works together to analyze the relationship between the organic structure of their molecule and the resulting function. The first version of this experiment was part of the Organic Chemistry 54 Laboratory during the spring of 2007. Students could choose from eight acyl chlorides which were available in the chemistry stock room. Using the feedback from Tufts students and the Teaching Assistants, Juniors Laura Truhlar (Tufts University) and Mark Williams (Morehouse College) reworked the laboratory as part of their HHMI Summer Research Experience. They improved the synthesis process by carrying out the reaction at room temperature, and made the experiment safer by switching to a less toxic organic solvent. They improved the biological assay by measuring optical density (OD) which created a more manageable dataset than the original biological assay. Additionally, they increased the number of possible acyl chlorides from the eight original to 20 different acyl chlorides, allowing for more possible types of penicillins. In 2008, Laura Truhlar gave two lectures to the Organic Chemistry laboratory course about the penicillin lab: the introductory lecture for the initial lab, and the follow up lecture for the biological assay. The students benefited from the improved synthesis that Laura and Mark developed during the summer of 2007, leading to a successful synthesis and bioassay. A paper describing the lab has been submitted to the Journal of Chemical Education. The Penicillin Lab is now a regular part of the Organic Chemistry Laboratory course at Tufts. Additionally, a professor from Scotland has contacted us to obtain a copy of the lab in hopes of implementing the lab there also. The Penicillin Lab has been accepted for publication in the Journal of Chemistry Education. "An investigative approach to the undergraduate teaching laboratory: synthesis and biological testing of penicillins." was authored by Ragnhild Whitaker, Laura Truhlar, Mark Williams, Deniz Yuksel and David Walt. 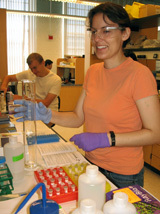 Laura Truhlar has finished refining the pencillin lab and continues to do research in the Walt Lab. Mark Williams and Laura Truhlar work in the hood on the penicillin project during the summer of 2007.